It is 6:57am, August 26, 2015. In 48 hours we will be heading home. Still meeting with counterparts, presenting findings, making new contacts, it’s a scramble more than a reflection. Then dealing with a technology slow down; no laptop, no wifi, limited Internet, it becomes a moment of isolation too, suspended between two worlds, the up close and personal everyday interactions here, hugs, shared transportation, face to face meetings, hours of down time, planned schedules that take on an unplanned life of their own and work out in their own way, completely unplugged versus the jazzy, slick, fast paced, immediacy of my USA world. I think to the immediately busy world I will be returning to; kids start school in 2 days, a joint paper to be written and presented in DC in 2 weeks, explaining the human development side of the quinoa story, and the HR Departments I need to visit for my adjunct contracts, U Mass fora special issues in economics senior seminar, Mount Holyoke College (MHC) where I am teaching and developing social business programs, and the School for International Training (SIT) needs my syllabus for the Service Learning and Management marketing course I will be teaching. My nine UMass students will be learning how to do an in depth analysis of Bolivia quinoa as a case study and then doing their own analysis of an industry or phenomenon that interests them. Maybe we will collaborate on an economic paper about Bolivian quinoa, they are senior economic majors, it will be a good item for their portfolio/resume to have co-authored a paper. I am looking for Fair Trade, organic quinoa products made in Bolivia and being sold in the U.S. For my MHC students to do a market study and feasibility analysis on how to access US markets with quinoa products. this ties in with the recommendations from my report that calls for a diversification of Bolivian quinoa markets, with emphasis being put on product transformation for both export and local market development. I still am seeking out counterparts and products in this, part of the last minute scramble. For my SIT graduate students, we will be learning social marketing through a partnership with the Brattleboro Winter Farmers Market. 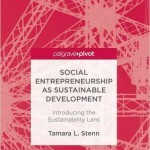 This ties in with my work in Social Solidarity Economy (SSE) which is so new in the U.S. But common here in Bolivia, though in the U.S. There are pockets of folks in places such as Brattleboro, VT, Keene, NH, Amherst, MA and many places in between where SSE is functioning and thriving in much more creative ways than in Bolivia. Part of my “next steps” will be unifying the two worlds a bit more. Bringing more of the Bolivian participatory governance, the system of Dirigentes Orginarios, Mallkus and Markas to my small town of Brattleboro and more of the ideas of Time Banks, Community Sponsored Agriculture (CSA), partnerships with university students, and social business development to Bolivia. And another part is to take time off for nothing. Not to be working day and night like a “loco” and keep, make time for and value a network of interested folks, neighbors and collaborators, both locally and online to contribute to, facilitate and support exchanges. To paint, run, enjoy my family and community. To have a balance, relax, and know that all is functioning just as it should. In Bolivia it is so easy for me to wait an hour or so for a late counterpart, meeting, transportation though in the U.S. A 15 minute wait is excruciating, as I think of everything else I could be doing in that time instead. I will focus on not thinking so much of the doing, but of the being, reflecting in my day, contacts, valuing others around me more and appreciating who they are instead of just what they are doing. In the U.S. I have a hard time remembering names and tend to have more superficial relationships with many people, while in Bolivia I feel I know and remember the people interact with much more. Things have to be slow and personal in Bolivia, otherwise people will not work with you. There has to be a personal exchange before work is discussed; a conversation about local events, family and a feeling of knowing who each other is. Talk is slow and calm. Key phases are repeated often. Explanations are clear and logical, there is no assumed knowledge. When new ideas are presented the presenter will ask “por que?” (Why) and reply with “porque” (because) and the explain the concept. This captures people’s attention and is a key phase indicating that something important is being presented. I will use this in my US teaching. I have conducted workshops with Catholic University (UCB) students and practitioners in La Paz, high school seniors in Quillacas and Anzaldo, agronomy students and ago-engineer doctoral students at San Simon University (UMSS) in Cochabamba. There are many small lessons learned her. I notice how different my lessons are when spoken in Spanish as opposed to English. Spanish is more expressive and indirect, I speak it more slowly and clearly, repeating key information more and putting more vocal emphasis on key terms. I used to do this more in the U.S. When working with international students and corporate employees (as a corporate trainer) but then sped things up over time, assuming students were already familiar with the materials I was so familiar with. Though sometimes they are not. I will remember to slow down and be more clear again. So this moment of reflection is coming to a close as time passes and I need to get the children and myself relay to travel from Oruro, where we arrived yesterday from Cochabamba, to La Paz in preparation for the final part of our trip…back to the U.S.! The church and the mountain the Guacho climbed in Quillacas. Located near the northern edge of the Quinoa Real heartland, Quillacas is a small volcanic town located amongst a vast expanse of flatlands. Known for its church, the site of a colonial era miracle, Salinas is home to ____ people. Economically people are farmers and merchants, being located alongside the main highway to the Salar (salt flats) and close to the “Quinoa Wall Street” of Challapata, where quinoa prices are determined daily. Woman operate small neighborhood stores and food stands alongside the main highway selling dishes such as chairo, a regional soup made of barley and chunos (dried potatoes) with llama meat, and chicharron de llama (fried llama). Though llama is featured prominently in dishes quinoa is not. The women say the quinoa is too expensive and they prefer to use it occasionally in their dishes, not daily. 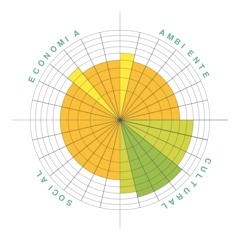 The Circles of Sustainability study was conducted in Quillacas from July 24th to 28th, 2015. The town was a regional education center and housed an internado for the students living further away to stay at. I worked with the graduating seniors, a class of nine students. Of this class, three lived in the internado (school housing). This study was conducted during the weekday so the students from the internado worked with people in the town (they return home to their rural communities on weekends). This resulted in the sampling being largely of the people living in Quillacas proper, not the outlying communities. I trained the students how to conduct the surveys and had each student complete at least six surveys, though some opted to complete more and two students left their surveys home and were unable get them to me before I left Bolivia. I conducted three surveys myself. In total the Quillacas sample size was 49. Though Quillacas is certainly an important quinoa growing region producing ____ tons of quinoa valued at $____ in ____, it was interesting to note that only __% of the people surveyed were associated with a quinoa producing/export group. I thought this could have been because sample was largely town based and the producers may have been living more in their rural communities, though I was told that in general few people from the Quillacas region belonged to producer groups. One of the few groups in the region, APROCAY,is made up of 52-families and works with Andean Family Farmers. Economically it seemed the people studied in Quillacas were the most negatively effected by the quinoa market crash than the other committees studied. The people ranked Quillacas as “bad” in their economic well-being, market access, access to consumer goods, and the local and export economy. There was a satisfactory ranking in the area of economic opportunities indicating that though times were hard now, the people believed things could improve. This was interesting because there had been several economic development projects funded by the Federal Government over recent years, with none every being used. A new market area had been constructed alongside the road with a parking area, bathrooms and ample market stalls but never used because the people could not agree on which stall each person would use. There was also tourism infrastructure built a few years ago including a roadside tourism center and a tourism outlook nearby. Neither were used because of a lack of leadership. No one could decide on how to use these structures. There were also new houses that had been built in a public housing project which remained empty because people could not decide on a fair way to organize their use. There was also an unused, commercial grade, quinoa processing plant which was built five years ago. it seems this lack of leadership and ability to work together is having a strong negative impact on the people of Quillacas’ well-being. Perhaps too, Quillacas’ extreme negativity was due to their proximity to Challapata 20 miles away which put them in closer contact with the dropping prices, which they learned of daily, or perhaps it was due to the lack of support the members received, due to their low participation in producer groups. A broader study which includes more of the rural communities and a deeper look at leadership is recommended. The natural environment was also ranked low in Salinas, perhaps reflecting the challenges of climate change and recently yields which were lower than other years. People reported being satisfied with the wildlife, though the overall environment, climate change, drinking water and energy (electricity and cooking gas) access, a clean environment and recreational spaces were all reported as being “bad.” The negative opinion of recreational spaces is interesting to note since there was a large plaza in the town which was rarely used as well as a new astro-turf soccer facility being built with funding provided by the national government. 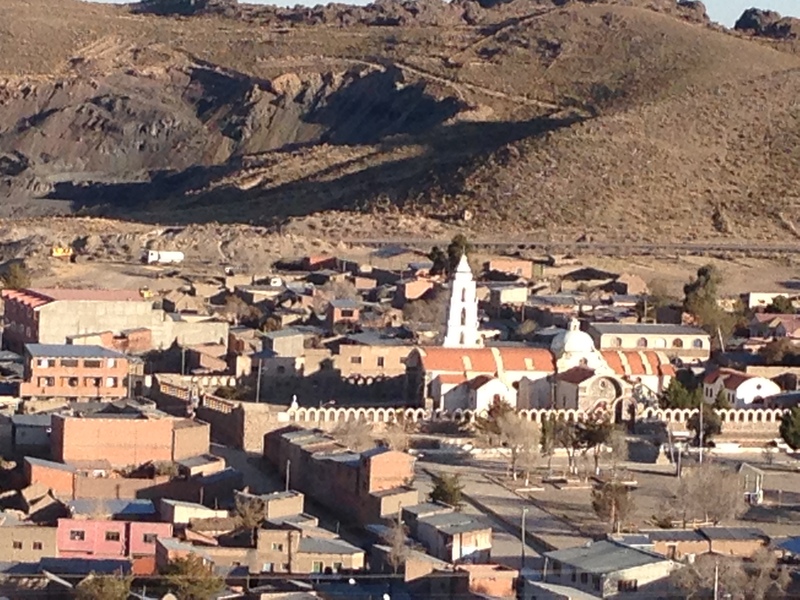 Like other towns in the Southern Altiplano, the cultural environment of Quillacas was more robust. People felt in general the community valued their culture, traditional dress, religion, and indigenous wisdom well enough. They were particularly pleased with their community festivals, family celebrations and language use with ___% people speaking Aymara and (insert language breakdown data). On the average, people reported the social environment in Quillacas as bad. There were poor health services, education, decision making and trust. People often opted to travel to the city of Oruro, two hours away, to have their babies with some giving birth on the roadside not making it to the city hospital in time. In addition, the newly elected mayor, a woman, was not well viewed by the town. She was from a rural community and seemed to be favoring her community with her staff selection. She was not often in he office and provided little communication or transportation to the town. There was not known about the projects or opportunities she would be working on. Though I met her briefly, she was traveling elsewhere and could not be interviewed during this study. Quillacas was a surprise in that it had such varied economic opportunities but seemed to be making little use of them. The women I interviewed spoke of the lost opportunities with a wistful air and were hopeful for new ones to come their way. They voiced hope that they would be more successful with future opportunities though seemed unable to step forward in resolving their past development challenges. Many of the all male, Native Governors were present throughout the Quillacas study though they did not seem closely aligned with the town needs They readily participated in the Circles Study and helped to quickly organize a women’s meeting for later that evening, however the meeting took place the same time as parent-teacher conferences at the school, resulting in many mothers not being able to make the women’s meeting. In addition, in the meeting they challenged the women when the women began to speak about their extra roles as housekeepers and child care takers. The male governors also asked for more machinery to help with their quinoa harvest but did not seem particularly interested in the other areas of development or well being. The leadership and gender challenges that Quillacas faces, in leu of many opportunities, are interesting to examine in future studies. In addition, including Uyuni and the Potosi region in future studies (which was prevented this time by political upheavals and blockades) will provide a larger data base and help to better define the “norm” in women’s well being in Bolivia’s principle quinoa growing region. Is the positive cohesiveness of Salinas or the start lack of cooperation of Quillacas more the norm, is it something in-between or perhaps something else completely different. The next study in December 2016 – February 2017 will be looking at these differences more deeply and also examining how people’s perception of their well-being changes over time. Students parade a model airplain in Bolivia’s colors in celevration of the country of Bolivia’s birthday, August 6th. The Circles of Sustainability study was conducted in Anzaldo from August 4th to 9th, 2015. In a one hour interactive, demonstration, I trained a total of 77 students in two separate graduating classes (approximately 38 students per class) to conduct the survey with family and community members. Each student was given two surveys to complete over the weekend when many would be returning to their home communities. They were asked to pay attention to the gender and age diversity of their samples making sure to survey a male and female member and to include an age difference. In exchange for their participation in surveying, the students would receive a donation of 300Bs to their end of the year class trip. The students were familiar with surveys having completed an environmental survey study the year prior. In total 110 surveys were completed in Anzaldo representing a 71% rate of return. The Circles studies create a visual story of how people are perceiving their wellbeing in a particular moment of time. The data is based on a scale of 1 for very bad and and 5 for excellent. People are asked to provide basic demographic information such as age, education, family size, use of loans, property ownership, and political participation. 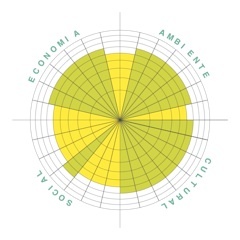 Then they respond to 33 opinion questions in the Circles’ four study areas: culture, social, economic, environment. The questions are similar to those used in Circles studies worldwide but are modified to best reflect the realities of rural Bolivia. For example, in other Circles models the section “social” is called “political” but due to cultural sensitivities in Bolivia about engagement is politics which is often assumed to be activism, I re-named the section “social” since the data is really directed more towards a social assessment of one’s well-being rather than a political statement. In addition, Circle’s surveys have a seven point range of opinion, however this would have been too complicated for the rural Bolivian farmers who were not used to this type of assessment so I modified the range to be just five points However, for assessment and comparison purposes, we wanted to maintain the seven-point range so a schematic was created to expand the five ranges into seven. 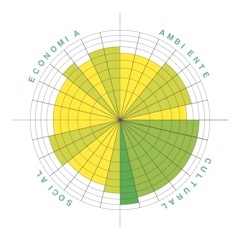 The Circles survey was used in three different quinoa growing regions: Anzaldo, Quillacas and Salinas. Though there was little variance between gender, age and education, there was statistically significant variation between places. There were some inconsistencies in the way the surveys were competed. In the Economy section, there were seven questions which applied to specific industries; mining, herding, tourism, handicrafts, non-quinoa farming, quinoa farming and business. Very few, if any of the people in Salinas work in mining, though several surveys had data indicating that perhaps they did. This will need further follow up for clarification. In addition it was unclear which community, if any, the people surveyed were from and if they house they had was in the town, community or both. Lastly many people indicated that they only spoke Quechua, even though the survey was being presented in Spanish. I suspect that there was a misunderstanding in this question with most of the people using the term Castellano to refer to the Spanish language so either the term Spanish was not properly recognized, there was an assumption that Spanish meant “no quechua” or in fact there are quite a few mono-lingual people in Anzaldo who only speak Quechua. Historically this would be found more amongst the women who had little formal education (which is conducted in Spanish). In the surveys both men and women with a formal education indicated they only spoke Quechua. Existing regional data can verify the language used in this region. For the Circles analysis, the information about the specific industry was dropped since no one place in the study had all of these industries and response rates were low. However this data per industry is useful in other studies and analysis. It will be safe to assume that at least half of the people surveyed lived in the local communities (as opposed to the town). Further studies of the communities themselves will be completed in the December – February 2016-2017. From a brief, visual overview, the overall economic well-being of Anzaldo is satisfactory, falling in the midrange value of three. People are reporting to have satisfactory levels of economic well being, market access for their products, access to consumer goods, and adequate production for regional/national consumption. However the community showed a stronger dissatisfaction (bad) in their production of goods for export (which they do no have any) and economic opportunities to improve one’s economic livelihood. This negative opinion of opportunity is also reflected in the migration rates, where people are tending to move elsewhere for work and opportunities. The environment also has an overall mid-range onion of being satisfactory. Participants are generally satisfied with their access to drinking water, the state of the local wild-life (rabbits, foxes, birds), community access to energy such as electricity and cooking gas, and recreational spaces. However there is a degree of dissatisfaction with the natural environment in general as well as the presence of environmental contaminate, mostly discarded garbage in the form of plastic bags and discarded containers. Climate change and drought no doubt at behind the negative perception of the natural environment, the weather is less predictable and frosts and hail come at different times than before, damaging crops. In addition, with the improvement of roads and electricity over the last 10 years, more consumer goods are coming to small towns. The increasingly sophisticated packaging such as plastic bags, bottles and laminated containers, especially with refrigerated goods, is causing much environmental contamination. Many municipalities do not have a regular garbage collection service or plan. So often garbage is discarded in the streets or burned. Culturally, people in Anzaldo are generally satisfied. They feel their culture is adequately valued as is their dress, religion, festivals, family traditions and indigenous knowledge. There is a large presence of the Catholic Church in this town with a church run boarding school and priests from Spain and Venezuela. Often Spanish volunteers come to perform work with for the church in the areas of education and community development. Sunday Church services include songs in Quechua and broadcasts in the main plaza. In addition, there are financial investments which the church makes in the area of education and youth development. The local school has a large supply of sports equipment and the town soccer team is known for its skill and being well prepared. Socially the town is suffering. 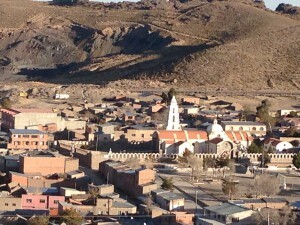 Though people have a satisfactory view of education, they feel that the overall political environment in Bolivia is poor, as is the community access to healthcare (even though there are two regional hospitals in the community), the overall physical health of the community, and the ability of community members to make decisions together and to trust each other. There was a recent election and the new mayor had been in office for just a month at the time of the study, so uncertainty in how the mayor will be managing the town might have influenced peoples views. In addition,the mayor mentioned to me that though they have the hospitals, there are not many doctors since city doctors do not want to work in such a rural location and there are not many rural doctors. Overall, more research needs to be done to better understand the poor social climate found in Anzaldo. In conclusion, the town of Anzaldo is more or less a contented community of small farmers. In comparison to the large quinoa export regions, they are much more satisfied with their steady, local economy and well-being than those who have more earnings, but a less stable economic environment. Culturally they rank lower than their counterparts in the quinoa export regions. Perhaps this is because in the quinoa regions indigenous leadership and pride is much stronger with elected Native Leaders taking active roles in community development. With new agricultural development focus from UMSS and also existing programs from the development organization Pro-INPA, which has an office in Anzaldo, new opportunities can be created. Women also expressed interest in developing stronger local markets and local food processing. This can lead to the creation of a more robust and diverse local economy as well. Children line up in Salnas’s main plaza for the annual “Little Salts” celebration. The self-declared capital of the prized Quinoa Real, Salinas, a town of ____ (population) sits on the northwestern edge of the vast Uyuni salt flats. Here ____ hectares of quinoa is cultivated yielding quantities of ___ valued at _____ (2014). Once a remote outpost at the edge of the Oruro Department, Salinas is now connected to the world markets via a recently paved highway. It has electricity, a hospital, a small military base, cell phone and internet service. It is also Bolivia’s first quinoa exporter having sent a container of quinoa to Peru in 1984 and is home to the Fair Trade association APQUISA and the privately owned QUIMBOLSUR, two large quinoa exporting organizations. The Circles of Sustainability study was conducted in Salinas from July 15th to 21st, 2015. It was winter vacation for the schoolchildren so I was unable to solicit student help for the study. 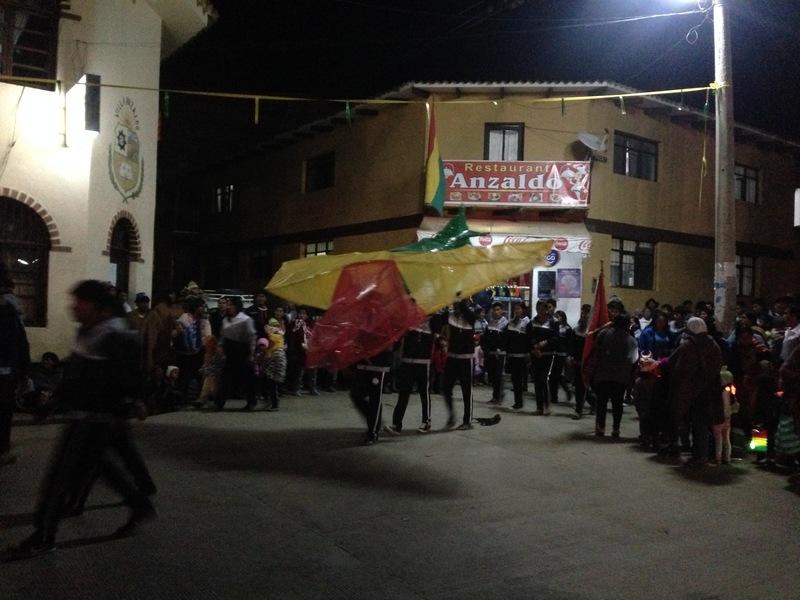 However it was also the village celebration of the Salititas (little salts) and hundreds of families came in from the countryside and cities to march, dance and celebrate the children and folkloric history of the town. I surveyed 31 people myself and APQUISA adminisrator Omar Nina and his sister, Melva Nina surveyed 40 more people in total giving us a sample size of 71. Omar and Melva were trained in how to conduct the survey with family and community members and earned 5Bs for each properly completed survey (a total of 200Bs). Most (__%) of the surveys were completed by community members who were also associated with a quinoa producing/export group giving Salinas the largest percentage of community members associated with an organization. Overall the participants of Salinas reported a robust cultural well-being with a deteriorated social, economic and environmental well being. More specifically in the area of economics people reported being satisfied with their local quinoa production and consumption however their export production, market access, financial well-being and overall economic opportunities were poor. This was due to an unexpected plummeting of quinoa market prices, which had been increasing by __% annually for the past five years. A year ago quinoa prices were at 1,800Bs a quintal. During the week of the study they dropped from 800 to 600 to 500Bs. This was due to the introduction of high yield, dual harvest, conventional quinoa production from Peru which flooded the market causing prices to plummet and put Peru ahead of Bolivia as the number one quinoa producer worldwide. The prices continued to drop to 250Bs at the time of this being written, a month later. Though production costs and yields can vary, a certified organic quinoa farmer needs to sell his product for at least 600Bs a quintal to cover his costs and 800Bs a quintal to have adequate earnings. The world Fair Trade price for quinoa has be set at 920 a quintal, a dignified price for the quinoa farmers, though only a very small percentage of all quinoa is sold at Fair Trade prices. The organically certified quinoa has held its value maintaining itself at 600-650Bs a quintal. Environmentally people were effected by climate change reporting overall poor to satisfactory environmental conditions. The general state of the natural environment, the climate and access to drinking water, energy, electricity and cooking gas were all looked at as poor. There were still a few communities who did not have electricity, drinking water was often not available especially in the town, and gas tank deliveries were made weekly to the town, causing people to have to conserve their gas use for cooking so as not to run out and to also have to carry the heavy tanks to and from their rural communities. Though people complained of birds, rabbits and moles eating their quinoa production, they did report satisfactory levels of wildlife in the area. Participants reported Salinas’ culture to be from good to excellent. 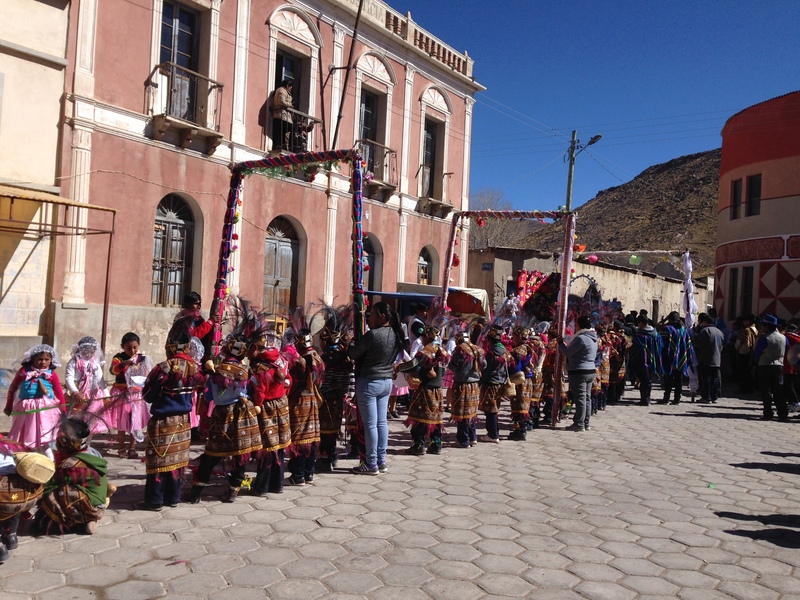 The overall culture was well valued as was traditional dress, language (most people spoke Spanish and Aymara and a few were tri-lingual, also speaking Quechua), religion, family and community celebrations. People reported an excellent transference of indigenous knowledge and proudly shared ancestral wisdom in relation to quinoa planting. Previous studies of this ancestral knowledge which uses the stars, animal behaviors, birds, wind and plants as indicators of frost, yields, good planting times and harvests have shown them to be effective in predicting climatic conditions in relation to quinoa cultivation. In addition, there is a strong indigenous leadership in the region for which people showed much cultural respect and pride. Salinas’ social well being shows the most variation in this study. Decision making and trust is satisfactory most likely due to the large number of participants involved with producer organizations which tend to take on a social role and are strong leaders and organizers in the community. However their health and education are poor. Rural community members reported having their local schools shut down and children having to attend school in the town which was not very accessible. Others reported elementary school leachers not being well prepared, falling asleep during videos they showed the children, and not being engaged or committed to educating the children. Many people complained about there not being doctors or medical specialists in the area and that the health care the received was of poor quality. Others reported traveling to the city of Oruro, three hours away, for better medical attention. The overall political environment of the country was listed as being very poor. This could be from the lack of support the people were feeling from the government for the economic crisis of the quinoa. It could also be due to the lack of further development the town received in areas of drinking water, health services and education. Or it could be due to a growing mistrust of the current government, which has been limiting people’s access to free speech, controlling he press and engaging in activities such as gas exploration in protected forests, previously prohibited by the current constitution. In conclusion, Salinas, is a town with a robust culture and strong sense of community that is struggling under the current financial crisis for quinoa and is still at the intersection of development, needing better support for key structures such as education and health care. Something not captured in the study which I would recommend be looked at in future studies, is migration. It is estimated that 70% to 75% of the people of Salinas do not live there full time. 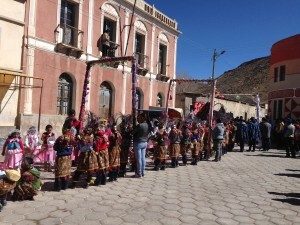 They have houses in the town and rural areas which they visit during village festivals and quinoa planting and harvest. Otherwise, community members are living in cities such as Oruro or La Paz or in other countries such as Argentine, Chile and Spain. The members living in other countries call on their cell phones to direct how much acreage needs to be planted while the urban residents travel to the region in their newly purchased cars and trucks, forming traffic jams in the countryside as families arrive and drive to their scattered plots to plant their quinoa. Not so long ago, they would have spent days walking to get this work done. Families also take turns staying in the countryside watching over the quinoa production. It is reported that when not growing quinoa, many migrants, especially the urban ones, do not work, preferring to simply live off their quinoa earnings. Another aspect of the migration is the large number of urban migrants who rarely visited Salinas in the past but now returned to the Salinas region regularly to grow quinoa.